Today is the big Unification Church evangelistic rally featuring Christian singers Hezekiah Walker, Yolanda Adams, and Israel Houghton. Bishop Noel Jones is supposed to speak as a warm-up for the Daughter of God herself, Hak Jan Han Moon, True Mother and co-savior of the world. Also speaking today, according to this press release, is Mayor Bill de Blasio. I suspect the author of Reckless Love never thought it would be sung at a Unification Church evangelistic service. Bishop Noel Jones said he has studied the Moons’ teaching and has used them with students in his church. This appears to be a pretty clear admission that he has left orthodoxy. The syncretism is strong in his message. Moon’s message was as promised. She claimed to be the only begotten daughter of God. Then, after some fractured history, she claimed that True Parents are the new opportunity to be born again and the way to receive the blessing and become the children of God. While evangelicals are selling out to politics, the Unification Church is quietly evangelizing the disillusioned. According to their leaders, the Christian era is over and the era of True Parents is here. As an illustration to their followers, Unification leaders use Christian participation in Unification events as a signal that Christian leaders are coming into the Unificationist fold. Watch Family Federation leader Michael Jenkins talk about Christian ministers who are coming into the Unification movement. On November 12, Yolanda Adams, Hezekiah Walker, Israel Houghton, and Bishop Noel Jones will open for her Messiahship, the Only Begotten Daughter of God Hak Ja Han Moon, True Mother of all Heaven, Earth and Mankind. The event is called Peace Starts with Me. Curtis Farrow will convene a choir of 5,000 unsuspecting Christians who will move a little closer to another religion. 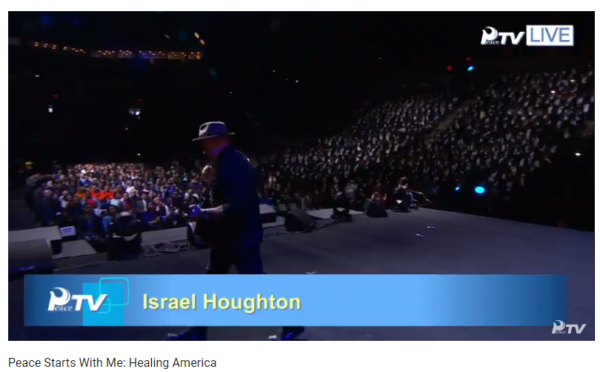 The Family Federation for a Heavenly USA (aka the Unification Church) has added worship artist Israel Houghton to the lineup of high profile Christians who will help evangelize New Yorkers for self-described True Mother and the only begotten daughter of God, Hak Ja Han Moon. 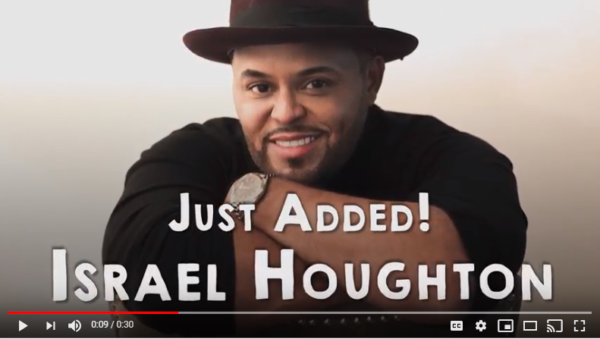 Houghton joins Hezekiah Walker, Yolanda Adams and Bishop Noel Jones as self-proclaimed Christian performers/speakers at an event which Moon’s followers hope will help establish her as a mainstream religious figure. She and her followers claim that Jesus failed in his mission by being crucified. In the modern era, her husband was the fulfillment of the Messianic promises and she is the daughter of God and only through she and her husband — True Parents — is their hope for reunion with God. I have heard no response from Adams, Walker or Jones regarding their support for this non-Christian event. Hak Ja Han Moon, the widow of Unification Church founder the late Sun Myung Moon, is called “True Mother” by the Unification faithful (Mr. Moon is True Father). True Parents are considered to be God’s chosen vessels to bring peace to the world and succeed in that mission where Jesus failed. The Unification Church hopes to use the Nassau event (and a similar one held in 2017) to enter the American religious mainstream and gain converts for their movement. Surprisingly, they have been getting help from several high profile Christians. In essence, Unification theology compensates for what Sun Myung Moon considered to be the failure of Adam and Eve, and then Jesus to accomplish God’s mission on earth. Moon (True Father) and his wife (True Mother) are the fulfillment of that plan and will successfully bring heaven on earth (known as Cheon Il Guk). The Unification Church hopes to unify all religions around Moon’s Divine Principle and establish world peace. According to them, Christians are misguided about Jesus. 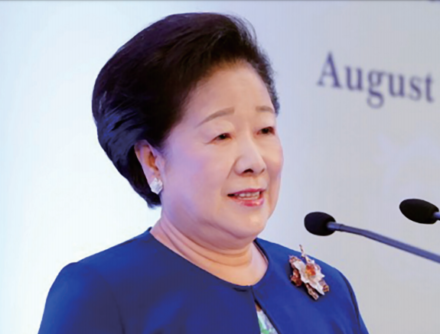 In a March 2018 speech, the same Hak Ja Moon who will be exalted in Nassau said that blasphemy against her will not find salvation. The Messiah; all of humanity yearns for the Messiah and the advent of the Messiah should at least take place at the national level. Unfortunately, 2,000 years ago, even though Heaven worked to prepare the people of Israel, they failed in their responsibility and Jesus could not stand on a national level and emerge as the True Parent. Hence, [Jesus] prophesied that he would come again. Therefore, with regards to Heaven’s providence, when looking at the 2,000 year history of Christianity, what is more important than the Second Advent of the Messiah, is the advent of the Only Begotten Daughter who comes from Heaven’s lineage with no relations to Satan, just as Jesus did 2,000 years ago. Unless the Only Begotten Daughter is born, the returning Messiah cannot advance to the position of True Parent. In the gospel of Matthew, it is written that people can be forgiven for slandering the Messiah. However, whoever blasphemes against the Holy Spirit cannot be forgiven. Do you remember this passage? This means that with regard to the history of the providence of restoration through indemnity, we are in the Last Days. Whoever blasphemes against the Only Begotten Daughter, True Mother shall find no salvation. You must understand this. We are in the Last Days. Do you understand? In the July 2018 issue of True Peace Magazine, Hak Ja Moon describes her view of Jesus’ mission. Was Jesus welcomed? Jesus Christ was not born to be crucified. He came to realize God’s dream and humanity’s wish for all human beings to become sons or daughters of God. He came to guide and lead people to become God’s children. Where did the theory that states that believers can only receive salvation through the crucifixion and blood of the cross, come from? They did not understand Jesus’ true nature. Human beings have institutionalized salvation through priests and bishops, resulting in many problems during the past two thousand years. However, the Protestantism did not express understanding of Jesus’ true nature. Protestants did not know why Heaven’s providence led to sending the Messiah. Jesus died on the cross and said he would return. He would return to host the marriage supper of the Lamb. After waiting for two thousand years, was Christianity prepared to welcome Jesus? This is the issue. Fallen humanity cannot directly return to God. That is why fallen humanity needs the Messiah. The Messiah is humanity’s True Parents who can resurrect, revive and guide humanity to become God’s children once again. Heaven’s providence must reach its conclusion; therefore, the providence has advanced even with endless waiting and numerous difficulties. Thus, for the fulfillment of the providence, Heaven has prepared a foundation for True Parents to be born. The central figures are the True Parents and I am God’s only daughter, the True Mother. Death on the cross was not the original plan according to Hak Ja. But since he did die, a Messiah is needed now, and that Messiah has come in the form of True Parents. With True Father gone to the spirit world, the mission of Christianity isn’t salvation through the cross but to find and raise God’s only daughter. God’s daughter is humanity’s True Mother who is here now to usher in God’s kingdom of peace. That is why I am doing so many things now. It is all for you and your future generations. How could you possibly deal with the Christians of today? Not knowing that the Lord has come again, those old-fashioned Christians hang on to their worn-out Bibles and offer prayers and devotions asking the Lord to come on the clouds. If they come to understand the providence, how much will they repent and lament? “The Lord came and went while I was still alive!” How devastated would they be by that thought? This fact would dumbfound them more than the fact that they waited two thousand years for nothing. I will create a book that will make them throw away their Bibles, a book that will make them feel that Father is eternally alive. This book is the Cheon Il Guk Holy Scriptures and was completed in 2015. The video clip above contains readings from it. Given these concepts, it is surprising and disturbing that high profile Christians would enthusiastically support the Nassau rally. The rally is central to church plans for mainstreaming their views. In a September sermon a Unification church service in New Jersey, Family Federation Vice President Demian Dunkley created enthusiasm for the Nassau visit by chanting repeatedly that “True Mother is coming.” He also spelled out the importance of the Nassau rally for the movement by telling the crowd that the 2017 Madison Square Garden meeting and other prior meetings around the world led by Hak Ja Moon had helped convince world leaders that Unificationists could be trusted not to be “some crazy cult.” In light of those successes, Nassau will be even more important. So what do you think Nassau is going to do? Do you understand how important it is? It’s protection for our world wide movement. It’s an investment for our world wide movement. It’s the elder son’s [United States is considered an elder son nation to Korea which is the promised land] responsibility to welcome True Mother on behalf of America and raise her up publicly, not at a private party. There is precedent for this use of public events within the Unification Church. On March 23 2004, the church arranged an event in the Dirksen Senate Office building which church leaders later portrayed to insiders as the crowning of Moon and his wife as the “King and Queen of Peace.” At that time, Moon declared himself Messiah and humanity’s savior at a ceremony attended by several U.S. lawmakers and international representatives. Have Jones, Adams, and Walker Converted to Unificationism? I attempted to contact Noel Jones, Yolanda Adams, and Hezekiah Walker through their websites. Noel Jones operations manager got back to me to clarify my questions but I have yet to get any answers from any of them about their support for the event. They are obviously scheduled to be there but I would like to understand their rationale for evangelizing another religion, unless of course, they have converted, which they should disclose. To be sure, Christianity and Unificationism are two different religions. In Christianity, Jesus is Savior and only Lord. In Unificationism, he didn’t achieve his mission and God’s only begotten daughter is here to establish peace on earth. Although I wouldn’t attend if it was simply an ecumenical expression of a desire for peace, it isn’t just that. Let’s be clear that the church is hoping that this event and the Christian cover given to it will help them become more mainstream and help them grow their movement. Richard Cohen, founding guru of the International Healing Foundation, just can’t quit the Unification Church. Despite saying a bunch of times that he left the church, he and his staff just keep showing up on their agenda. Now he is doing one of his healing ex-gay workshops for Unificationists with Phillip Schanker, one of the chief Unificationists in the U.S., as host. Although not sponsored by the Family Federation, the workshop is hosted by Schanker and is being marketed to disciples of the late Sun Myung Moon. This program is sponsored and hosted by Phillip Schanker, former director of the family department of the Unification Community in the USA. Our special guest facilitator is Richard Cohen, M.A., psychotherapist, author, and founder of the International Healing Foundation (IHF), who has helped thousands experience radical healing and freedom over the past 27 years. To learn more about IHF and Richard’s personal journey from homosexual to heterosexual, visit www.comingoutloved.com. NOTE: This private retreat is intended for current or former Unificationists and their loved ones, but it is not sponsored by or affiliated with the FFWPU. To respect those who would prefer that your participation be confidential, your registration information will be known only to Phillip Schanker, and only registered participants will receive details about the location of the program. This makes sense as Moon’s son endorses Cohen as the foremost expert in the church. Despite claims that she left the church, IHF staffer Hilde Wiemann conducted workshops for the Unification Church in 2013. In my opinion, the IHF bottom line is money. The source of it doesn’t much matter. Richard Cohen in action. Wonder if there will be a special price on tennis racquets at the conference? Liberty University’s current provost, Ron Godwin, was appointed by Rev. Sun Myung Moon to take his teachings and use them to revive and resurrect American Christianity. Moon knew Godwin intimately, and repeatedly praised him publicly for his usefulness in taking the Moonie message to the American Christian church. Father sees the presence of Dr. Ron Godwin, Dr. Bob Grant and Dr. Don Sills as very precious. Father looks at these precious three collaborators, supporters and members of this great movement almost like Jesus’ three disciples. The three of them are really accomplished giants in our world. By uniting with Reverend Moon’s ideology they will become even greater. Each of the three has very special characteristics. They are very different characters, as much as Jesus’ three major disciples were different from each other. [Speaking to these three men.] Father said you are lucky. If you fulfill your mission, fine. If you don’t fulfill your mission, that is fine too. The reason is you are responsible for the first generation. The second generation is already mine, I claimed them already. But I don’t want to see the first generation become like Moses’ flocks who perished in the wilderness. It is very difficult to wipe out the concepts initially implanted in the first generation. Even Bob Grant, a great preacher and Don Sills, a great preacher and Ron Godwin, a great Christian leader, have been reading the Bible which says the Lord is coming on the clouds. That is the concept they have. Billy Graham has been preaching the Lord is coming on the clouds. For you the important thing is not the Washington Times or AFC or the Coalition for Religious Freedom. Wherever you go, that is your house, your podium. Your podium is not only your church. Wherever you are standing or wherever you meet people that is your podium. Those three champions, just bring them and work them day and night. If they can’t keep up with the schedule and they run away that is alright, I will bring somebody else. But I think those three strong men won’t run away. Father invited Ron Godwin to join in this great crusade not because he is such a great business man. He is, but more importantly Father is concerned about Jerry Falwell, who represents the great Southern Baptist Christian community. He is not fulfilling his responsibility, so Father would like to see if Ron Godwin can fulfill it. Unless he knows me now, Jerry Falwell is in the position of a foreign person. Jerry Falwell cannot become president himself, he should come together with Father and make the spiritual and moral foundation for a God-chosen man to be President of the United States. We have to have a righteous God-centered president in this country, not just anybody. The Washington Times is a side activity, the prominent mission is a spiritual mission. That is basically what Father is saying. This is very important: the Washington Times is secondary. As far as Father is concerned your primary mission is a spiritual mission and the revival of Christianity is crucial. The AFC alone cannot save the country. Christianity must be rejuvenated. All Christian ministers must be re-educated. They must become new Christians. Unity with Reverend Moon is of vital importance. Without it, no matter how much they do, God will not be on their side. You should be a champion for the teaching of the Divine Principle. You should be able to teach them and testify to them much better than anyone else because you have that background. I abandoned Korea and came to the United States because of the importance of working on the world level. This is a key important statement: an alliance between Christianity and the Unification Church is absolutely vital. It is a life or death matter for this country’s future. It is not easy because of public opinion and the media, but this is God’s will and it can be done. These three most Abel-like champions will spearhead this work. I think you are here, not because of your own will, but because this is God’s will. You have been divinely ordained, hand-picked by God to be here and represent each a different segment of Christianity. For that reason you have a crucial role to make that alliance between Christianity and the Unification Church. Do you follow? I know those words are harsh and difficult to hear. But I am registering this as a testimony to God and the world. I’m not embarrassing you at all–again, I am doing it with a parental heart. Nobody else in the entire world would say anything like this to you. But Reverend Moon, with absolutely no personal ambition in it, is saying this to you because he is living with a parental heart. Christianity in the United States has done the most evil against me; you know that. But I have no grudge or vengeful feelings. I have only sympathy. I only want to bring life to this country, that is my sole desire. However, my departure for Asia is immanent. Therefore I want to have some champions in the United States to take responsibility and move this country. You three can do the job. You will be like the three disciples of Jesus. Each one of you will put your self in Jesus’ position and multiply three disciples of your own. Then your number will grow to a team of twelve. With twelve people of your character and determination, at this level, you will be invincible. Your catch phrase will be the that American Christianity needs resurrection more than revival. Let us resurrect American Christianity. It is crucial to the survival of this nation and the world. New York is a rotten place, you know that. 42nd Street is a living hell. Father would like to have 8th Avenue up to 42nd Street cleaned up. Only by resurrection of the Christian spirit can this be accomplished. You follow, right? Reverend Moon is going to go up and have a little meeting with Mrs. Moon. Father will come down shortly but Father would like us to proceed with the testimonies of these three men. [Dr. Ron Godwin gave his testimony talking about the USA activities and his part in it. Afterwards Dr. Pak gave a testimony about Dr. Godwin and his first meeting with Father at Danbury. Father returned, and Ron Godwin made a presentation to Father on behalf of the Washington Times family. It was a large drawing of an Atlantic salmon. Time has passed very quickly, but Father is very satisfied and fulfilled in his heart because Father has been assured that the three heavenly musketeers will do the job. Father looks at them almost as heavenly locomotives pulling the train of America in the right direction. They are locomotives, but not electric ones, they are choo-choo trains. Father likes that sound. Don Sills said wake up America. What is a better way to wake someone up than by making a locomotive noise? I feel very confident that even though I may not be here all the time, if you trust these three musketeers and unite with them and join with them and work together toward the goal, I am sure you will fulfill a great victory here in America. I have read many of Moon’s “sermons” and I can’t really make much sense of them. Some of this is probably because they are translations from Korean (seems odd that the Messiah didn’t speak English well). In any case, the point is that Moon wanted some kind of revival of Christianity in his image and he called on the “heavenly musketeers” to lead the way. These ties are just a few of many between Moon and religious right figures. You can see an all-star team of them in this video. This event marked the transition of Moon’s movement from a church to what he called “The Family Federation for World Peace and Unification.” As remarkable as it seems, key religious right figures such as Gary Bauer, Maureen Reagan, Jack Kemp, Beverly LaHaye, and George Bush I were there to give Moon a huge platform. Pajama Pages has an interesting piece on the link between Liberty University and Benny Hinn. Then the historic link between Liberty founder and Unification Church founder Sun Myung Moon is explored. I was aware of this and have considered writing about it several times. I have some additional information on religious right figures and Moon which I may post at a later time. Liberty issued a statement denying the link between the school and Hinn. However, the LU provost did appear on Hinn’s show. Provost Godwin says he appeared based on a misunderstanding. However, the fact that he appeared at all is harder to understand and unexplained.